On Friday, my daughter baked macadamia nut cookies with white chocolate chips (yum). After the plastic measuring cups and spoons got washed, I took them out of the dishwasher and was going to put them away in a kitchen drawer, when I noticed that it looked awfully cluttered. I started taking things out and found a big tangle of old straws at the back of the drawer. 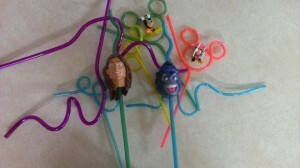 The straws came with kids’ meals from fast-food restaurants many years ago. Then they got stuffed in the drawer and forgotten. I don’t think anybody even looked at them in the past decade or so. The straw with a man’s head is the “George of the Jungle” cartoon character, and it used to make a noise like a wild man’s yell when you drank through it. The kids thought that was pretty funny at the time. It doesn’t make any sound now; but even if it still worked, the only thing any of us would laugh about is how long it sat around cluttering up the drawer.